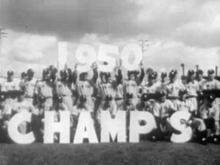 The 1951 Yankees celebrate their victory in the previous season's World Series. 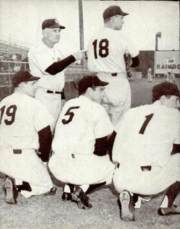 Casey Stengel lecturing Yankee players in 1951. Jerry Lumpe was signed as an amateur free agent by the Yankees. Don Taussig was acquired from the Yankees by the New York Giants. April 17, 1951: Mickey Mantle makes his big league debut for the New York Yankees. The Yankees opponent is the Boston Red Sox. May 1, 1951: Mickey Mantle hits his first major league home run. The game was played against the Chicago White Sox and the pitcher who gave up the home run was Randy Gumpert. The home run was in the sixth inning and was measured at 450 feet. September 18, 1951: Allie Reynolds threw a no-hitter to clinch the American League pennant. It was the first time that a pitcher threw a no-hitter to clinch a pennant. May 14, 1951: Billy Johnson was traded by the Yankees to the St. Louis Cardinals for Don Bollweg and $15,000. ↑ John Drebinger (December 12, 1951). "DiMaggio Retires as Player but Expects to Remain in Yankee Organization". New York Times. p. 63.